Today, we are taking a look at Gengo (元号) and the new era in Japan, which is known as the Reiwa Era (令和). Where does the gengo Reiwa come from? How is it used? How is it connected to the Emperor (天皇)? Learn the answers to these questions and more! By the way, speaking of podcasts, you can find the English At Home Is Fun Podcast on Spotify, iTunes, and Stitcher Radio! Hey guys, this is Naho. This time, we’re going to be doing an interesting topic. 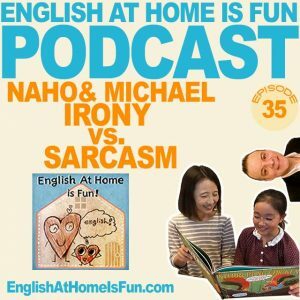 Instead of me talking about the Japanese culture, I am going to interview Michael about the American culture of sarcasm. I figured out that a lot of Japanese are puzzled by this, and so are all the foreign country English learners. And Micheal is here to clear out all the questions you have about it. Watch the video to find out!! Hey guys! We are so excited because the English at home is fun podcast is moving uptown to YouTube! 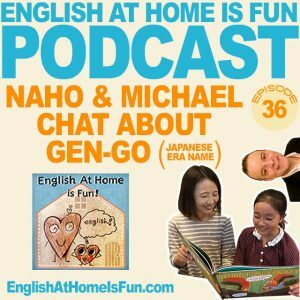 This is our first YouTube video together and Naho and Michael are so excited to share their ideas about learning English with you! We hope you like it. You can also get the audio as a podcast too!